With one in six drivers in the U.S. today over 65 years old and an aging Baby Boomer population, there are more older drivers than ever on the road today. Understandably, the question of whether people should continue to drive well into old age is a contentious one. 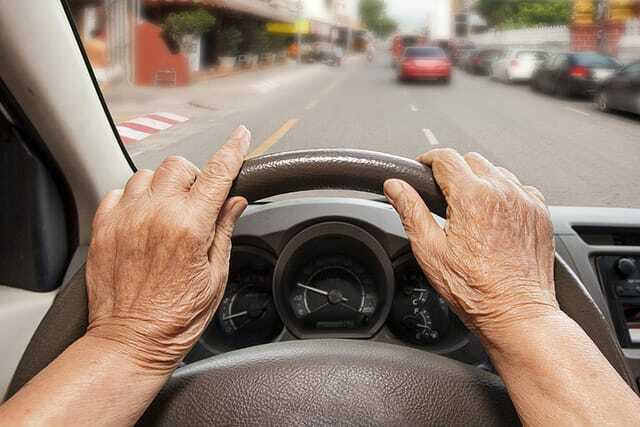 On the one hand, driving can help older adults stay mobile, independent, and connected to their loved ones and their communities. Yet, data consistently shows that driving gets riskier with age. Our 2015 Senior Driving study estimated that about 14 million Americans had been involved in a car crash caused by an elderly driver in the previous year. And the Centers for Disease Control and Prevention report that some 712 older adult drivers are injured and 19 are killed in auto accidents in the U.S. each day. While old age alone is not a reason to stop driving, age-related physical and cognitive challenges such as slower reflexes or vision troubles can make driving difficult — even dangerous — especially past age 80 or beyond. Recognizing the signs that an aging loved one is no longer able to drive safely is crucial. The next step is typically the hardest, though: how to talk to that loved one about giving up the keys. Where you might clearly see the danger of allowing an unsafe driver to continue getting behind the wheel, your elder loved one may fear the loss of their independence, ability to socialize and be a part of their community. As you and your family tackle this difficult topic, we’ve collected a range of resources to help you understand and navigate the next steps. It’s normal and inevitable to experience some age-related symptoms that make driving tougher as the years pass. Older drivers may be dealing with vision or hearing problems, not to mention reflexes that aren’t as sharp as they once were. In addition, many older adults in the U.S. suffer from serious, chronic illnesses that can impede their ability to drive safely, such as heart disease, diabetes, arthritis, Parkinson’s disease or dementia. In fact, according to the CDC, drivers over 65 are twice as likely as younger drivers to report having a medical problem that makes it difficult to travel. And the risk of being involved in a deadly car crash starts to increase among drivers who are 70 or older, with the highest risk among drivers who are 85 or older, the CDC reports. Below are some of the most common risk factors that can interfere with an older adult’s ability to safely operate a car. Having any of the following factors does not mean an older adult should immediately stop driving, but they can elevate risk and warrant monitoring. Vision is obviously a key component of driving ability. In fact, according to Elizabeth Dugan, author of The Driving Dilemma, “90 percent of the information needed to drive safely relates to the ability to see clearly.” From accurately reading the speedometer to detecting pedestrians on the side of the road, good driving requires good eyesight. 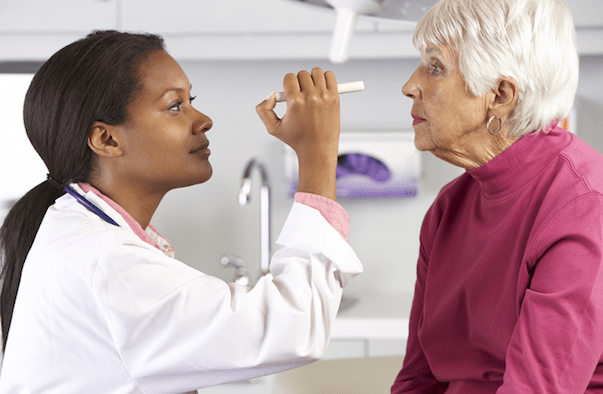 But deterioration in vision is an inevitable effect of aging; in people 75 and older, vision impairment rates increase significantly, according to the CDC. As the eye ages, far less light reaches the retina, for one thing. Older eyes are also more susceptible to cataracts, glaucoma, and other problems that impair vision. Encourage your family member to have regular eye exams, and check in with his eye doctor if you have concerns. Few people age without some deterioration in their hearing. In fact, one-third of those over 65 have hearing problems. Hearing loss can happen gradually, without the person realizing it, and undermine the ability to hear horns, screeching tires, sirens, and other sounds that would normally put someone on high alert. Make sure the person in your care has regular hearing tests. Many drugs can compromise driving ability by causing drowsiness, blurred vision, confusion, tremors, or other side effects. Certain drugs taken in combination can also interact and cause serious problems. If your loved one takes a lot of pills each day, as many elderly people do, be sure to educate yourself about the drugs and their possible side effects. Even herbal remedies and over-the-counter medications can affect driving ability. Talk to your family member’s doctors and pharmacist, and be sure to ask about possible drug interactions. How can you tell when the time has come for someone to stop driving? It isn’t always immediately obvious when an elderly person begins to have trouble behind the wheel. Your parent or other aging loved one may not notice that her driving skills are deteriorating or may not want to acknowledge it — and you may not care to either. Of course you want your parent to maintain her independence as long as possible, but don’t wait for an accident to happen before you intervene. We’ve developed guidelines that will help you avoid being an alarmist yet also realize when the time has arrived that driving is no longer a safe activity for the person in your care. Watch for the following signs of a dangerous driver. If you’ve observed some questionable driving on your aging loved one’s part, ask whether they’ve gotten any tickets for speeding or other violations. Naturally, it’s best to do this in a neutral, non-accusatory way at a time when they’re not behind the wheel. If you’re not comfortable asking about tickets, ask whether your loved one’s car insurance rate has gone up. If the answer is yes, this may be a sign that they’ve had recent driving infractions. This is an especially telling sign for a driver that typically has not had tickets or warnings from law enforcement in the past. When your aging loved one is not with you, walk around their car look for signs of damage. Everyone’s car gets nicked now and then by someone else’s door in a parking lot, but does her car have the kind of scratches or dents that could indicate driving mishaps? If so, ask her about them. Notice whether your parent is reluctant to drive, seems tense or exhausted after driving or complains of getting lost. She may, for example, decline invitations to social events that require her to drive, particularly at night. This may be her way of acknowledging that she’s aware of her own limitations and is taking steps to avoid an accident. Discreetly check in with your loved one’s friends and neighbors and ask if they’ve noticed any driving problems. Don’t wait for your parent’s friends or neighbors to call you if you’re worried about your parent’s driving. They may feel uncomfortable approaching you with any concerns but may talk with you if you contact them directly. If you live far from your parents, try to identify one or two such people who would be willing to keep you informed about your parent’s driving and other safety matters. Contact them regularly, and make sure they have your contact information too, so they can reach you if anything comes up. Take several drives with your aging loved one at the wheel, and observe their driving with an open mind. Are they tense? Do they lean forward in their seat and appear worried or preoccupied? Does he or she often express irritation at other drivers? Do they seem particularly tired after driving? If so, your loved one is probably beginning to have some anxiety about driving. Do they fasten their seat belt? Do they sit comfortably at the wheel, or do they crane forward or show signs of discomfort? Do they seem tense and preoccupied, or easily distracted? Are they aware of traffic lights, road signs, pedestrians and the reactions of other motorists? Do they often tailgate or drift toward the oncoming lane or into other lanes? Do they react slowly or with confusion in unexpected situations? Do they consistently wait too long to respond to traffic lights or other driving cues? Do they stay in their own lane or let the car drift very close to the centerline? Does he or she complain of getting lost more than she used to? If you drive with him a few times and notice problems, it’s time to initiate a discussion about your concerns and whether it might be time for him to stop driving. If you’re not sure whether or not an older driver is safe behind the wheel, there are experts who can help. Make sure the driver is up to date with medical and vision exams. If you have concerns that health or vision problems may be impeding his driving abilities, tell his physician or eye doctor. Be specific about any symptoms you’ve observed. By law, doctors can’t share medical information without a patient’s permission, unless you have medical power of attorney or your loved one has signed a HIPAA release. Even if he refuses to allow the doctor to give you information, you should still alert the physician if you’ve noticed symptoms or behaviors that worry you. A certified driver rehabilitation specialist (CDRS) is an expert — usually a driving instructor or occupational therapist — who is trained to evaluate someone’s driving abilities. A CDRS won’t hesitate to recommend driving cessation if she believes a driver is no longer safe. At the same time, she won’t tell an older person to stop driving if it’s not warranted, no matter what the caregiver wishes. If an older driver is still safe behind the wheel but her skills could use improvement, a few sessions with a CDRS can help her break bad habits and learn new skills. A CDRS can also recommend safety devices, such as special mirrors or adaptive foot pedals. If the CDRS concludes that an older adult is no longer safe to drive, she’ll help ease the transition by providing concrete information and support. Many driving programs and geriatric centers have such experts on staff. You can also find a CDRS near you by consulting the directory on the Association for Driving Rehabilitation Specialists’ website. If you’re worried about whether an older adult is driving safely, using your state DMV (Department of Motor Vehicles) resources may help. Many state DMVs now have websites that offer information and resources on older adults and driving issues, including driver-improvement programs and driver self-assessments. 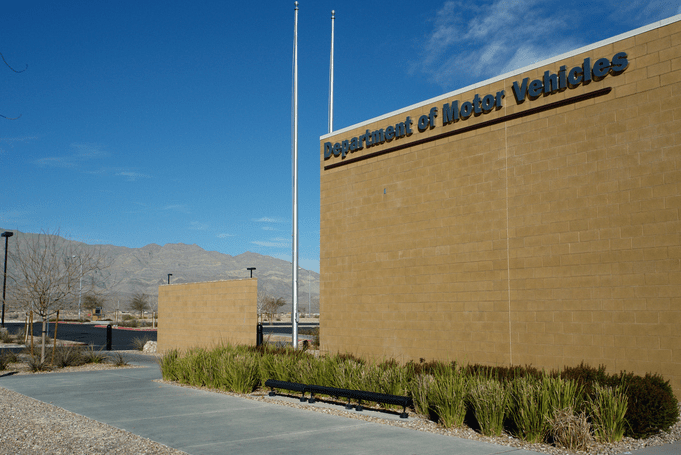 For example, California’s Department of Motor Vehicles even has a “senior ombudsman” who’s available to assist older adults and their families. Our state-by-state driving calculator provides contact details for your state DMV, along with other useful information regarding older adults and driving. If the person in your care flatly refuses to stop driving and you believe he or she poses a significant safety risk, you can file an unsafe driver report with your state DMV. A DMV representative will then contact your loved one and request a medical evaluation; a driving test may also be required. Depending on the findings, their license may be restricted or revoked altogether. Some states conceal the identity of the person who makes the report; others do not. Even if yours doesn’t, your loved one’s potential anger at you for “interfering” is preferable to letting them injure — or kill — themselves or a pedestrian through a driving error. If you have concerns about an elderly adult’s ability to drive, addressing them promptly could be a matter of life and death. It may be tempting to procrastinate — to talk to him next week or before the first snowfall, for example — but think how you’d feel if the delay led to an automobile accident that resulted in a serious injury or death. Considering the possible consequences should help you overcome your hesitation — but that doesn’t mean it will be easy. It’s awkward and painful to have to inform older adults that they aren’t capable of doing something as basic and essential as driving the car. For them, it’s another humiliating reminder of their growing inability to take care of themselves and manage the tasks of daily life. As difficult as it is, if you have reason to believe that the person in your care could be dangerous behind the wheel, it’s important to deal with the issue sooner rather than later — because later could be too late. Consider temporarily giving up the car yourself. Elizabeth Dugan, a geriatric researcher who wrote the book The Driving Dilemma, reports that a colleague stopped using his car for two weeks before talking to his elderly father about driving safety. His car-less weeks gave him firsthand experience of the inconvenience and lack of mobility that his father was going to have to endure. You may not want to give up your car before you talk with an older adult, but you should give some thought to the emotional and practical issues he’ll face when he gives up driving. When reflecting about driving and its role in your aging loved one’s life, don’t be surprised if they begin to talk about the past. He or she may reminisce about his honeymoon road trip to the Grand Canyon or recall how he saved up money for their first car or taught all the kids how to drive. Resist the temptation to interrupt and get them back on track. Instead, try to encourage the reminiscences by asking questions or even requesting to see photos. 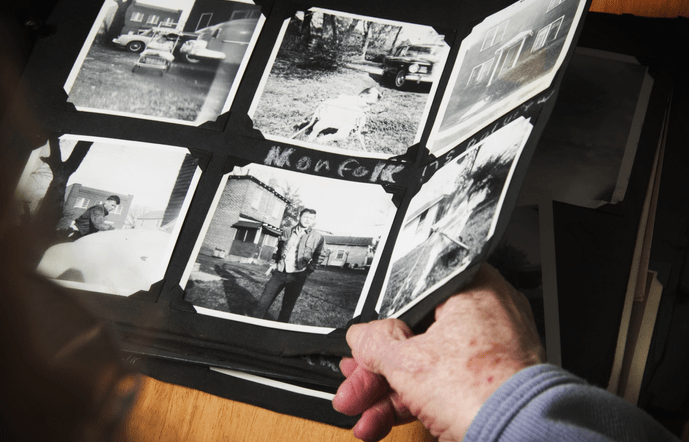 Sifting through memories will help them come to terms with this life transition as they reflect on the role driving has played in their life and gradually accept the fact that they’ll soon have to give it up. As the discussion progresses, ask your loved one directly what he or she thinks they should do about driving. You may want to help them jot down some of the pros and cons of the alternatives they face. This approach can help someone realize that there are actually some benefits to not driving (tremendous savings on auto insurance, car maintenance, and gasoline, for example). It also may help focus them on the stark consequences — such as a fatal accident — that could result from maintaining the status quo. Find out if medical problems are causing driving issues. If the person you’re caring for acknowledges that they’re having difficulty driving, find out the specific problems. Make appointments with their physician and eye doctor, and be sure to ask about medication, side effects and drug interactions. It’s possible that the problem can be remedied with a change in medication or a stronger pair of glasses. Make sure that your loved one’s car is suited to their needs and physical abilities, and ask their doctor if assistive devices might help address driving difficulties. Discuss interim measures, if possible. Once you determine the source of the problem, you can decide what to do next. Your loved one’s doctor might suggest limiting driving to daylight hours or essential errands. If they’re going to continue to drive at all, it’s a good idea for them to brush up on their driving skills and the traffic laws by taking a senior driving refresher course. Organizations such as AARP, AAA and commercial driving schools all offer these types of courses. Agree to revisit the decision every few months to see how it’s going. Help explore other transportation options. Whether or not your elderly loved one has to give up the car keys immediately, it’s a good idea to help them become familiar with other transportation options. Take the bus with him or her if they’re apprehensive and help them find out more about local senior transportation services. Encourage them to carpool with friends. Take a break if they refuse to address the issue of driving safety. Your loved one may become angry when you try to talk about driving or refuse to discuss it, so it’s a good idea to temporarily drop the issue. There’s no point in engaging in a battle — it will only make them more resistant. Give the matter some time, and then bring it up again in a week or so. You may find that they’ve become more receptive to discussing the matter over time, as they grow used to the idea and realize that the risks of continuing to drive outweigh the benefits. How can I persuade my father to stop driving? It depends on what’s prompting the doctor recommendations and if this was a firm, evidence-based diagnosis or an off-the-cuff, rushed remark. If there’s any doubt, get a multidisciplinary assessment of his driving fitness. The American Occupational Therapy Association has a database listing certified driving rehabilitation specialists so you can find one in your area (http://www1.aota.org/driver_search/index.aspx). It may be that with retraining or some adaptation your father can keep driving safely or modify his driving behavior to minimize risks. However if he can’t, then it’s time to intervene. Start by talking. Ask open-ended questions to find out how he sees the issue. On average we’ll outlive our ability to drive by about ten years. Has he thought about how he will get around when he is no longer safe to drive? What are the alternatives to driving that he is comfortable with? If talking calmly and openly doesn’t work you may have to try other steps. Medically unfit drivers can be reported to the licensing authority (i.e., department of motor vehicles). State’s differ in how they respond to reports, but it usually triggers official action that may compel him to make the change. Giving up driving won’t be easy for the person in your care, both from a practical standpoint and an emotional one. No more driving can result in increased isolation and dependency. In some cases, it means that an older adult can no longer live on their own. Listen. You may feel like changing the subject when he or she speaks wistfully about driving or their car, but resist the impulse, especially during the first few weeks after they stop driving. Your loved one is mourning a major loss, and talking about it will help them come to terms with their grief. Don’t attempt to jolly them out of their sad mood or find the silver lining in the situation. Instead, just listen. Share memories. Encourage your loved one to talk about some of their cherished driving memories, look at photos together and ask about their favorite driving experiences. Revisiting the role driving has played is their life will help them get through the grieving process. Watch for signs of depression. If he or she shows signs of melancholy or seems withdrawn or particularly irritable, these could be symptoms of depression. Other symptoms can include sleeplessness, fatigue, and loss of appetite or excessive eating. If you suspect that your loved one is depressed, consult their doctor. Be there. Make a point of being even more available than usual to your loved one during this transition period. Check in regularly and be sure to include them in family activities. Encourage them to keep up social contacts and offer to drive them when you can. If you live far away, check in frequently by phone and visit as often as possible. 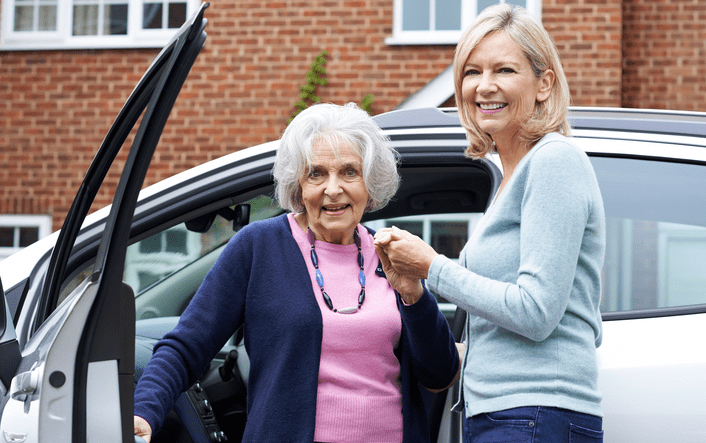 Along with supporting an older loved one emotionally when they have to give up driving, you can also find practical ways to help them make the transition to being car-less. Learn about paratransit. Research local paratransit and other alternative transportation options, and accompany him the first few times he tries public transportation to make him feel more comfortable with it. Identify informal transportation options. Brainstorm possible transportation opportunities. Is there a neighbor or friend who would be willing to drive your loved one for a small fee or even no fee? Options that incorporate opportunities for social contacts are especially helpful, such as carpooling with other older adults to activities at the local senior center. Help him or her find activities that don’t involve driving. Your loved one may need help, especially at first, finding ways to occupy their time without a car. Suggest possible volunteer activities and other projects. Is there a school nearby that needs tutors, for example, or a hospital where they could read to sick children? Offer to help if he or she wants to launch a house project, like organizing their garage or planting a garden. 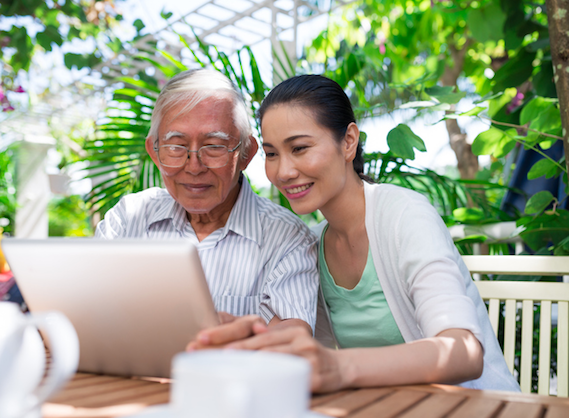 Make sure they’re aware of local activities and resources for older adults in their area. Do some additional research to find information for your loved one. AAA offers advice for caregivers, as well as information about transportation resources around the country. The National Association of Area Agencies on Aging also provides its own guide: Transportation Options for Older Adults. The American Public Transportation Association offers a directory of mass transportation resources around the country. Wherever older adults are on the driving continuum — whether they’re still driving, driving with restrictions, or must give up driving altogether — you can play a valuable role. Your caring, active participation in their lives will reassure them that ceasing to drive doesn’t have to sentence them to isolation and boredom. Below are some steps you can take to help them transition to life after driving. Make it a habit to check in on them often, just to chat or share some news. Offer to drive them to the activities they enjoy — or help find someone else who can take them. See that they’re included in family outings, like their grandchildren’s school events or a day at the beach. Encourage them to try taking the bus on their next trip to the pharmacy, or to walk, if it isn’t too far away, and offer to go with them if you can. Urge them to ask for rides from friends, and to reciprocate in whatever way they can (preparing a meal, for example). Help them develop new routines and interests that don’t require driving, like gardening, walking, or swimming at the local pool. Your support and involvement in their lives will make giving up the car a far less lonely and frightening prospect. Transportation is rapidly changing, not least because of the proliferation of new ride-hailing services such as Uber and Lyft. In a short time, these convenient services have become crucial for getting around cities. You might think these kinds of services have been a boon for seniors who are unable to drive. But many seniors either don’t have a smartphone or aren’t comfortable using it. Others may need cars with handicap accessibility or help getting to and from the door. Furthermore, ride-hailing services are really only available in cities, leaving people who live in more rural areas without these options. 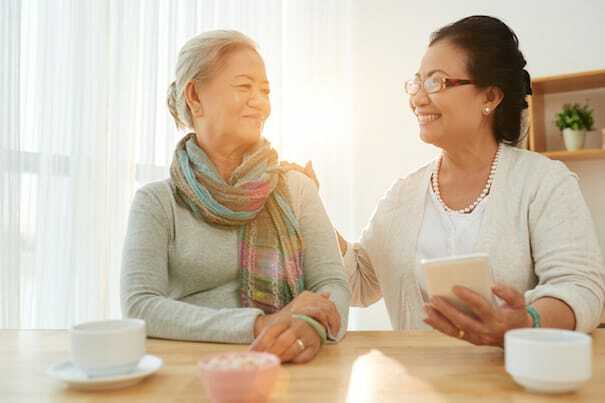 Luckily, a variety of services have cropped up recently to help seniors, and their caregivers, address some of these challenges, including recent initiatives by industry leaders Uber and Lyft. In 2015, ride-hailing behemoth Uber started a pilot program in Gainesville, Florida, to provide transportation for residents of two senior living communities. The company offered technology tutorials to help seniors get comfortable with using the app to request a ride. In 2016, Uber expanded the program to all seniors in Gainesville. Though that program has yet to expand, Uber also offers some extra assistance for seniors with its Uber Assist program and has launched uberWAV in Toronto, giving riders a wheelchair-accessible option. On the other hand, the company has been criticized at times for not offering more services for people with disabilities and has been sued under the Americans With Disabilities Act to provide more access. Like Uber, ridesharing giant Lyft is taking steps to improve its outreach for seniors and access for people with disabilities. Last fall, Lyft announced a slate of solutions for obstacles to seniors using its services, working with partners to take Lyft requests over the phone and to make it easier for groups working with seniors to requests rides on their behalf. Lyft has also been working on making its service more accessible to people with disabilities, but, like Uber, its coverage is spotty and it has faced lawsuits over its ADA compliance. Lyft has a setting in its app to request a vehicle capable of accommodating wheelchairs, but in areas where Lyft doesn’t have such vehicles it recommends another service that may need to be booked 24 hours or more in advance. One service that’s popped up to help seniors manage Uber and Lyft is Go Go Grandparent, a call-in service that helps people who either don’t have or aren’t comfortable with smartphones to arrange rides. The service offers an extra measure of assurance by employing “professional grandchildren” to make sure the ride goes smoothly and features an option to alert the rider’s caregiver where their older loved one is going and who their driver is. The service is largely automated but operators are available if necessary. The company was founded in Los Angeles last year by Justin Boogaard and David Lung. Boogaard says he started the service just to help his own grandmother and took all calls himself. But his grandmother had an active social life, and before long he was taking calls for about 100 of her friends. It was affecting his sleep, and he realized he had to hire a staff. Go Go Grandparent began charging for the service (19 cents per minute in addition to the standard Uber or Lyft fee), and now have accumulated tens of thousands of customers. Another smaller service similar to Go Go Grandparent is Arrive. Arrive is a members-only service that dispatches Lyft and Uber rides to customers, many of whom do not have smartphones. Live operators provide an even higher level of service, giving drivers detailed descriptions of the riders before pickup. “Most of what we’re doing is directing the driver when they’re at the address to find the rider,” says Arrive co-founder Amy Stice. Hours of operation are limited to between 9 a.m. and 6 p.m. Pacific time, so most of the company’s customers are still on the West Coast. But some East Coasters have been taking advantage of the service for evening activities like going to dinner, Stice says. Stice, too, got the idea for the service when she was arranging Uber rides for her grandmother in Moraga, California. Now she’s providing the same service for between 100 and 200 others, half of whom don’t have cellphones at all. In some of the country’s more rural areas, Liberty Mobility Now has emerged as a solution for basic transportation needs and a first- and last-mile solution for often spotty public transportation access. Based in Lincoln, Nebraska, Liberty Mobility Now operates in seven states, employing its own fleet of drivers as well as partnering with whatever other transportation options are available to get people rides. The company’s goal isn’t to compete with Uber or Lyft but to fill in gaps, Bassinger said. Liberty Mobility Now covers areas of Ohio, South Dakota, Colorado, Virginia, Missouri, is working on operating statewide in Nebraska and is about to launch in Corpus Christi, Texas. While they provide rides for anyone, well over half of their clientele is seniors. The company provides its drivers training for ADA compliance and instructs them to go above and beyond with services like helping riders with their groceries. A company offering a comprehensive approach in the San Francisco area, SilverRide, was launched back in 2007, well before Uber or Lyft. Its services are even more comprehensive, sometimes accompanying seniors on their outings if desired or necessary. Before even going anywhere, SilverRide drivers spend time with their clients and families to plan outings. They’ll take them on errands like doctor’s appointments and grocery shopping, but also to ballgames, museums, restaurants and parks, according to the company’s website. When they pick up clients, the drivers go inside to help them to the car, and when they arrive at their destination, they walk the client inside as well. Via — a carpooling service operating in New York, Chicago and Washington, D.C. — has been very popular with seniors in New York City. Seniors accounted for 27 percent of their riders late in 2015, according to an article in New York Magazine. The service is simple: after booking a ride, a shared car picks up passengers at nearby street corners and they ride together. Uber and Lyft offer similar services that have received mixed reviews, but seniors in New York have raved about Via’s cheap prices and sense of community.